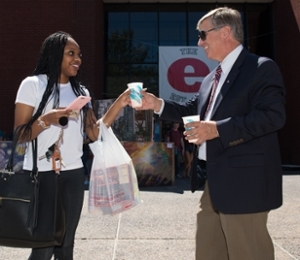 Southern Illinois University Edwardsville greeted students Monday on the first day of classes with free lemonade. Posters on sale to decorate residence halls or apartments. Check out what University Departments have to offer. Take free photos with friends and decorate the picture frame. Enjoy refreshments before class, receive information and giveaways and experience a welcoming atmosphere for evening students. 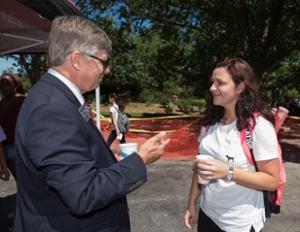 SIUE Chancellor Randy Pembrook offers a free cup of lemonade to Myesha Gorrell, a junior psychology major. Pembrook engages in conversation with Kimberly Daum, a junior nursing student.